Pressure vessels of “thin” shell construction that are fabricated from 1/2” thick or less steel plate material are routinely used in the power generation, chemical, petroleum, and food processing industries. Some of these vessels are subjected to relatively severe operating conditions that include chemical attack, rapid pressure and temperature fluctuations, and steam/water hammer. As a consequence, many owners or operators perform scheduled nondestructive testing of the units to determine a vessel’s mechanical integrity. Many of these pressure vessels act as an accumulation point, requiring the units to be equipped with one to two dozen nozzles that penetrate the shell and/or heads. These nozzles are often secured to the pressure vessel with fillet welds on both the ID and OD surfaces of the unit. An acceptable vessel examination procedure includes testing the circumferential welds, the longitudinal welds, and all these nozzle welds. The most common form of weld nondestructive testing is visual examination, but an increasing number of owners or operators are testing their pressure vessels by the wet fluorescent magnetic particle technique, which is a more sensitive test procedure. This examination technique can detect surface and slightly subsurface indications in the material. It is not unusual to find many more indications by wet fluorescent magnetic particle than by visual examination. However, because wet fluorescent magnetic particle examination is not required by the original code construction, the integrity of the code still remains. A vessel’s perceived integrity only becomes questionable after cracking is found in a vessel that has been examined by the wet fluorescent magnetic particle technique for the first time in its operating life. A more complete resolution of the vessel’s mechanical integrity assessment should be performed by evaluating the indications or cracks found during testing. Finding indications in the welds and plate material often presents the dilemma of what to do next. If the indications are cracks and not plate defects, (such as laps, which compromise the minimum wall thickness of the vessel, or are long and relatively deep) then the obvious answer is to repair the cracks. Many times, cracking in a weld is interpreted as a poor quality weld. To minimize further problems, the old weld is removed and replaced by a new weld. Regrettably, many cracks are either repaired or new welds are installed without knowing the cause that initiated the cracking in the first place. This lack of knowledge can sometimes result in further cracking of the same area. Repairing cracks without eliminating the cause of the cracking can be a short term solution to a long-term problem. The following three examples demonstrate how the cracking pattern around the smaller nozzles (less than 2”) in a pressure vessel can help identify the source of the problems. 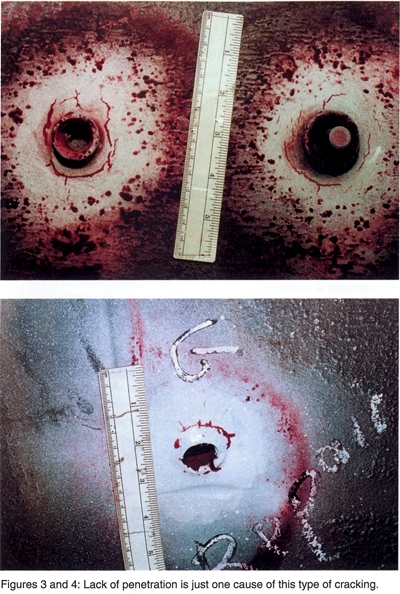 These examples are used only as an illustration of the evaluation process and are not to be implied as the only causes resulting in nozzle cracking. Cracking as the result of abnormally high nozzle loads that have exceeded the anticipated or designed nozzle loading is generally characterized by the appearance of “stretch marks” around the weld in the base metal as shown in Figure 1. The cracks usually follow the contour of the weld and tear the surrounding base metal due to the weld filler metal having a higher tensile strength than the base metal. 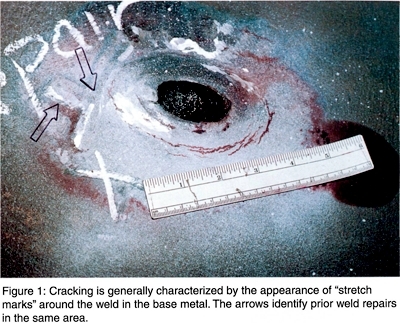 Prior weld repairs to the same area indicate a persistent problem and are identified by the arrows in Figure 1. The most common cause of a high external load is the result of a poorly designed or a poorly functioning support system. This deficiency occurs when the loads are transferred from the support system to the nozzles. These types of loads can result from adding a piece of equipment to the nozzle or connecting piping without modifying the existing support arrangement. In addition, high loads can result from a malfunctioning pipe support or added restraint. A visual examination of the support system within the first 30 feet of the nozzle or pressure vessel will usually identify this sort of problem. Many vessels are subjected to thermal expansion because of the temperature increase that occurs under normal operation. Thermal expansion causes the vessel to increase in size which means the equipment and piping connected to the nozzles must also be able to move with the vessel. Vessels that are supported and fixed at one end should have a sliding support on the other end that enables the vessel to slightly expand and contract. The “stretch mark” pattern around the nozzle shown in Figure 1 was caused by the addition of a fixed restraint to the hi-lo water level drain piping. This fixed restraint was the result of the piping being routed through an undersized hole in the floor plate. Because the movement of the piping was restricted by the floor plate, eventually it caused the drain pipe to bend which resulted in frequent cracking of the nozzle in the ID of the unit as shown in Figure 2. 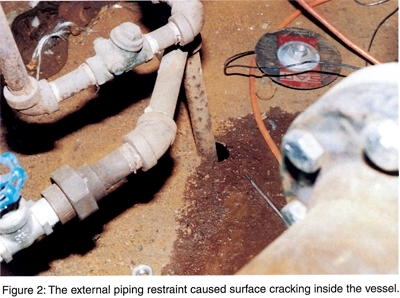 In other cases that resulted in a similar crack pattern, restraints had been added to stand pipes, level transmitters, and chemical feed lines because of either vibration or long pipe connections to the vessel. Lack of penetration is the lack of adequate weld filler metal deposit at the root of the joint. The root of a nozzle joint is the interface between the nozzle wall and the shell or head. This type of cracking will propagate through the weld in the same pattern as the root, but will break the surface of the weld in a radial direction around the nozzle if the crack encounters a weld defect such as porosity, slag inclusions, or lack of fusion as shown in Figures 3 and 4. This orientation change in the cracking can add confusion to the evaluation of the problem. The repair consists of removing all of the fillet weld and preparing the area for welding with a small diameter welding rod such as a 3/32” diameter rod. Chemical attack of the weld typically occurs in the heat-affected zone (HAZ) in the toe of the weld. The attack occurs at this location because of the slightly different microstructure created by the welding process. The general appearance of this type of cracking is circumferential at the toe of the weld and around most or all of the outer diameter of the weld. The cracking pattern is similar to one that can result from fatigue. However, because it is a chemical attack it will occur in nearly all the welds in a particular zone of the vessel, such as the locations above or below the liquid level. The cracking pattern from chemical attack is different from fatigue cracking which usually occurs at specific locations that have a recurring or cyclic tensile load applied to the area. In the case of chemical attack, a solution would be to repair the weld and make adjustments to the chemical input. Remember, any long-term repair should remove all signs of the defect and discourage other defects from returning.